MW Mobile Blog: We have beer. We'll know in a week. 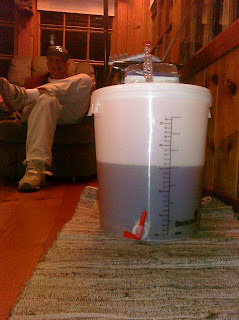 Only 4.2 gallons, because - Sean says - Joel shorted us on the malt. That looks dark for a pale ale. Any immediate reaction to the wild hops collected ? It looks like Kettu's homegrown hops were very nice. The wild hops didn't have much of an aroma, so we started the boil with them and used them for bittering hops. Kettu's harvest was used towards the later end of the boil for additional bitterness as well as aroma.